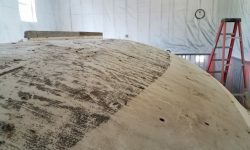 The sharply curved coachroof was mostly covered with Treadmaster nonskid, a flexible sheet product with an aggressive pattern. 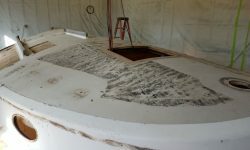 The installation in this case was rather rough, with pieced-together sections and lack of attention to detail. 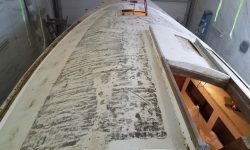 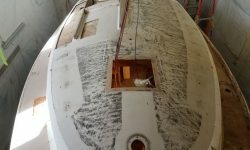 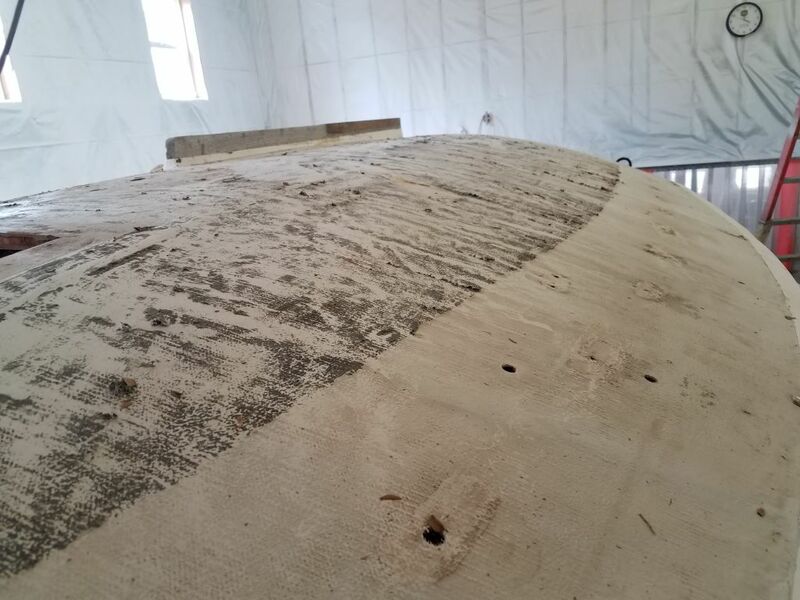 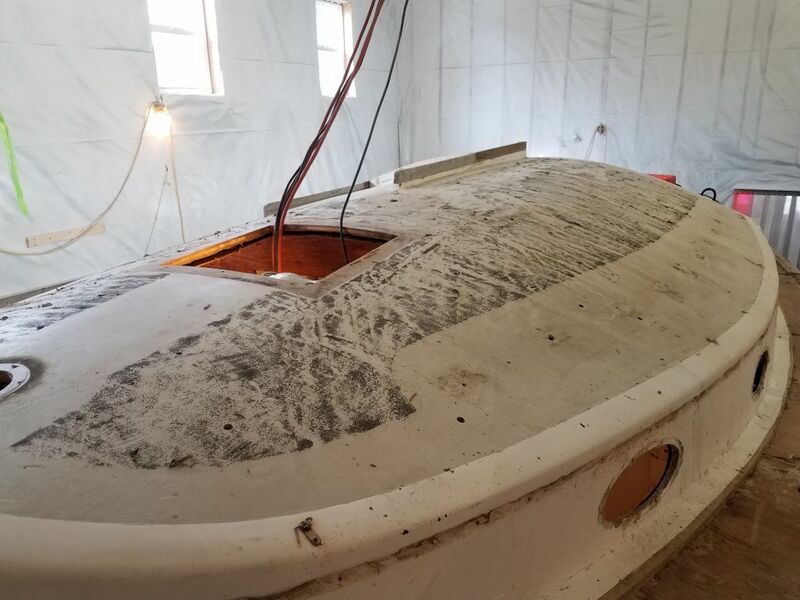 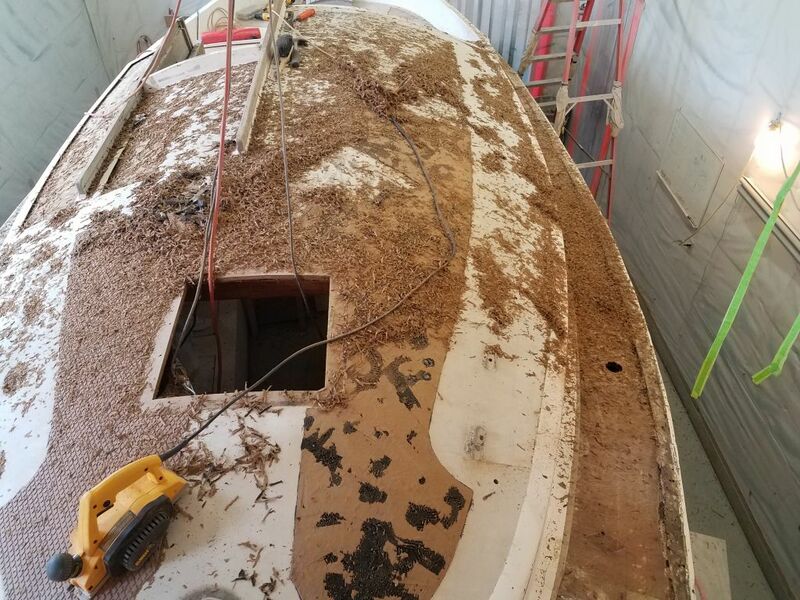 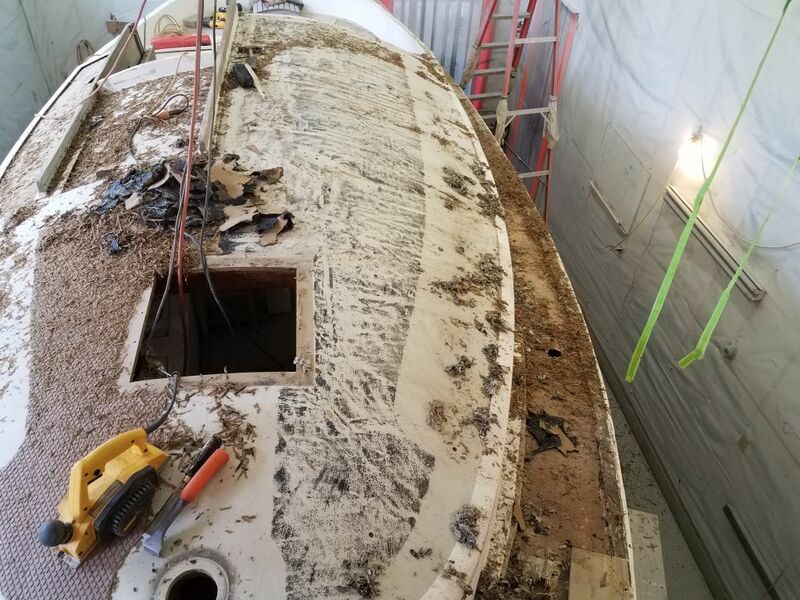 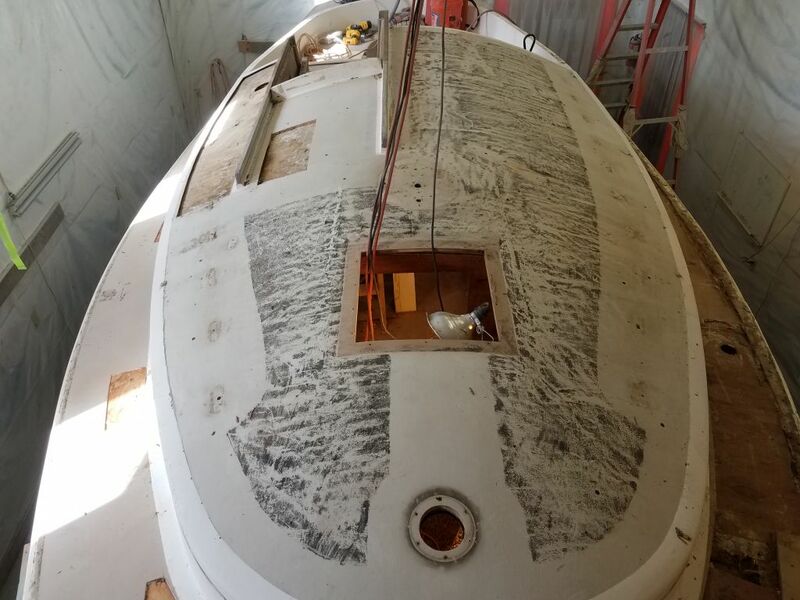 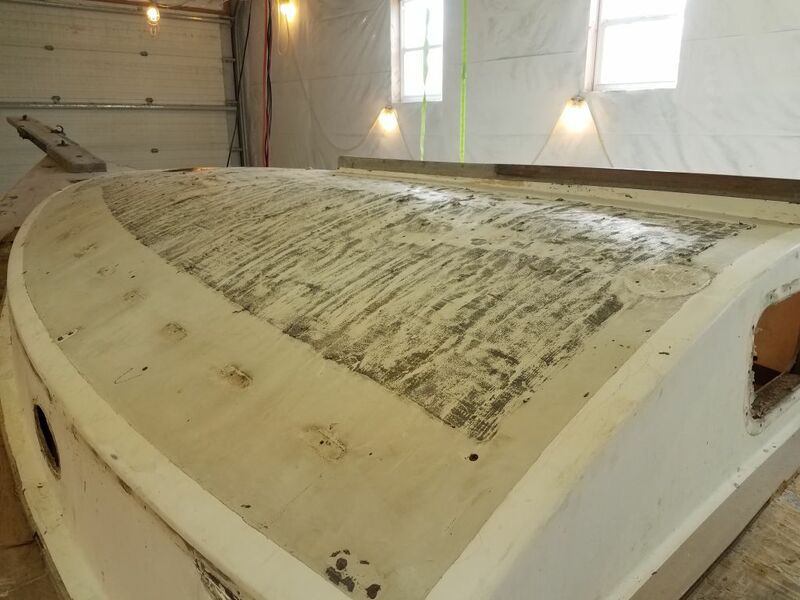 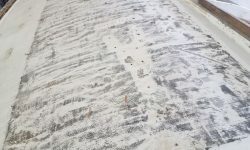 In order to continue with the deck repairs and deck refinishing, I needed to remove this, not only because its appearance was poor, but the deck beneath–which had been repaired at some earlier time–was extremely roughly finished and uneven, and required additional work and refairing. 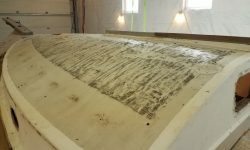 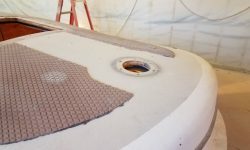 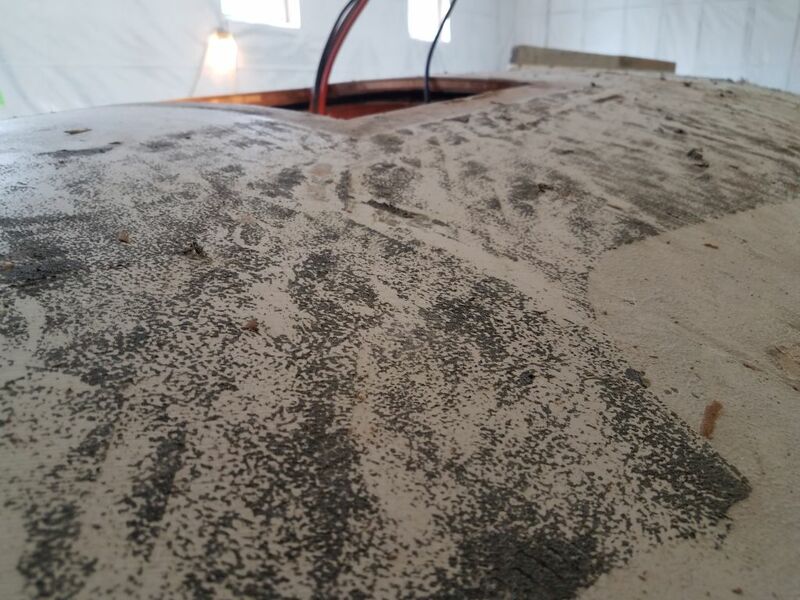 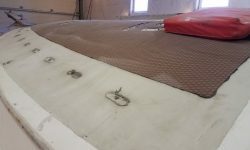 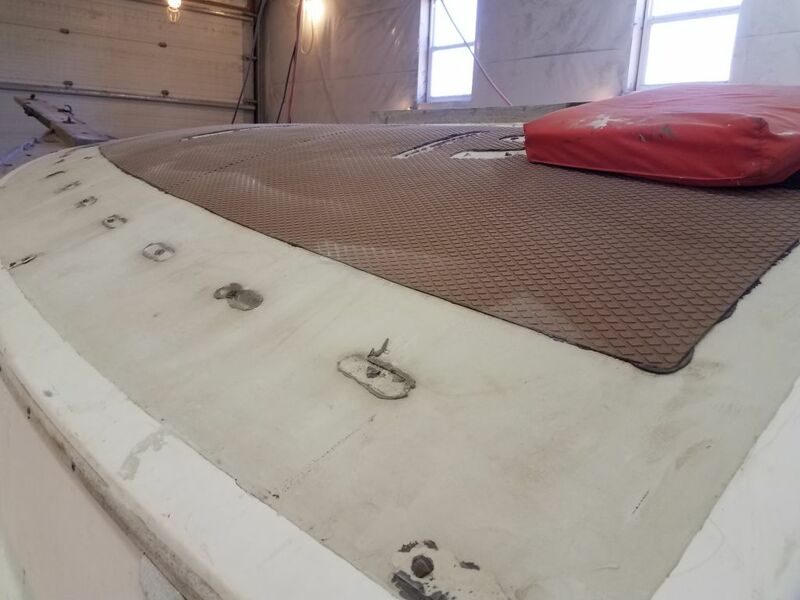 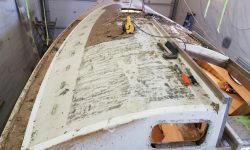 The nonskid sheets appeared to be installed with a flexible adhesive rather than epoxy or similarly aggressive adhesive, and this promised to make removal relatively possible, if unalterably tedious. 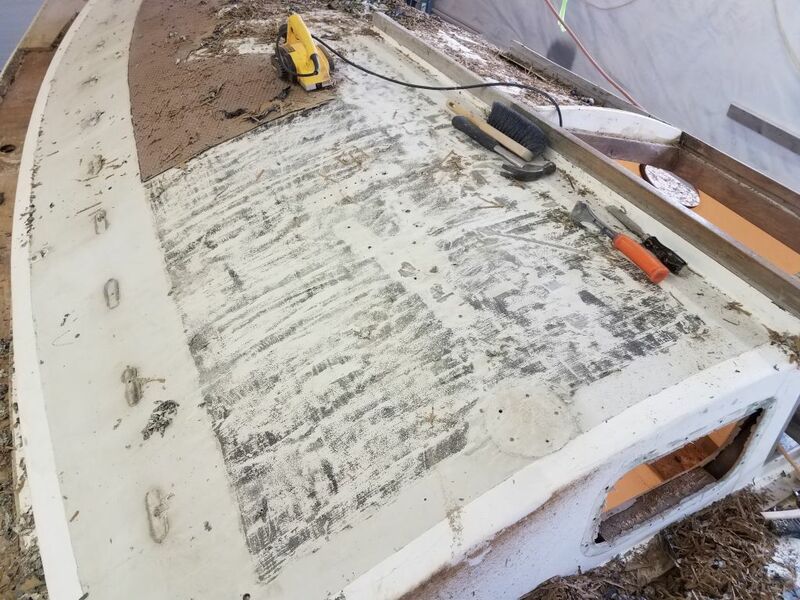 During an earlier removal test, I’d found the Treadmaster relatively easy to scrape free with a chisel, but this was slow. 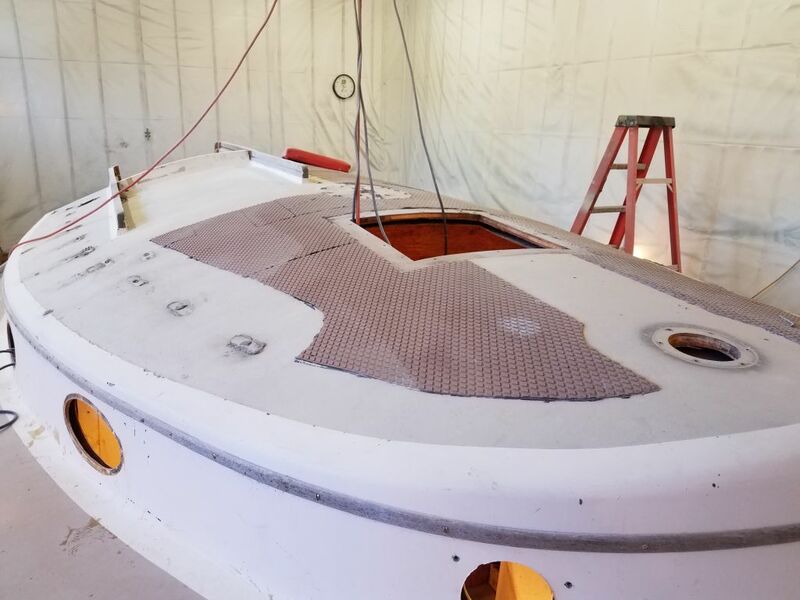 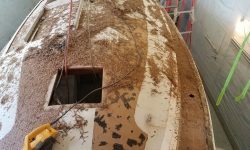 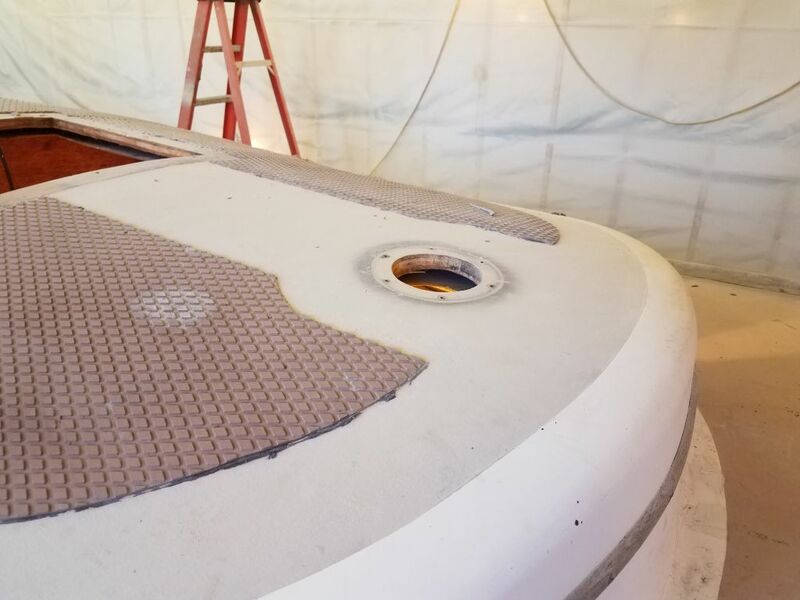 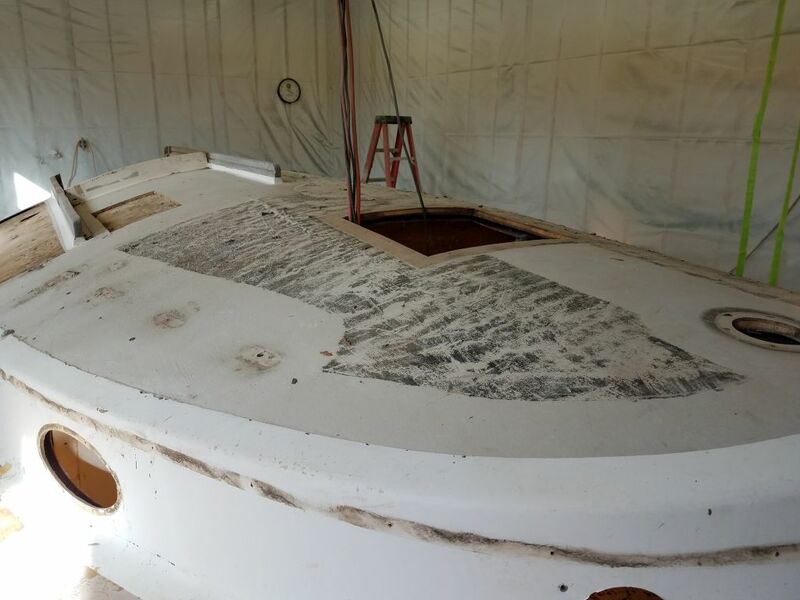 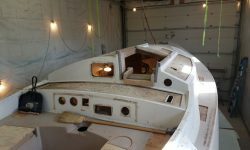 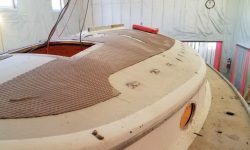 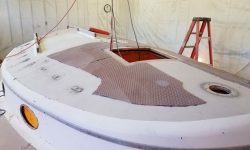 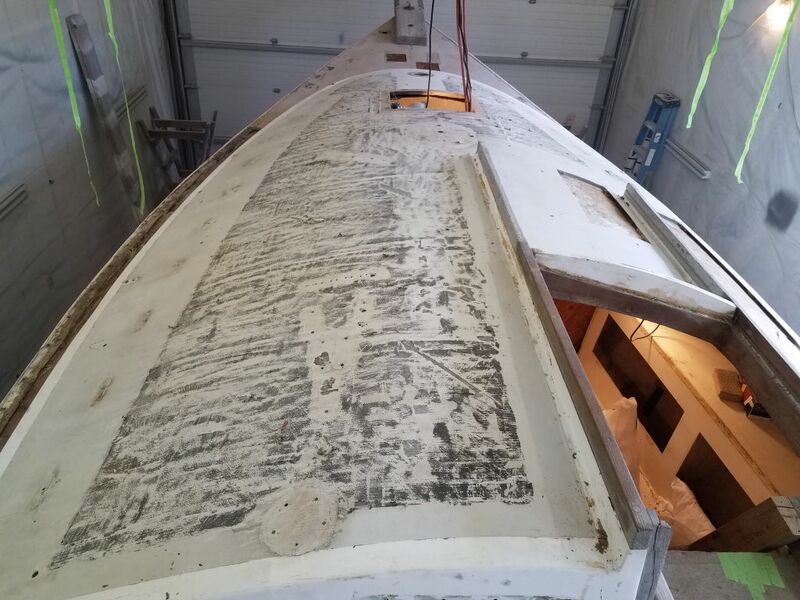 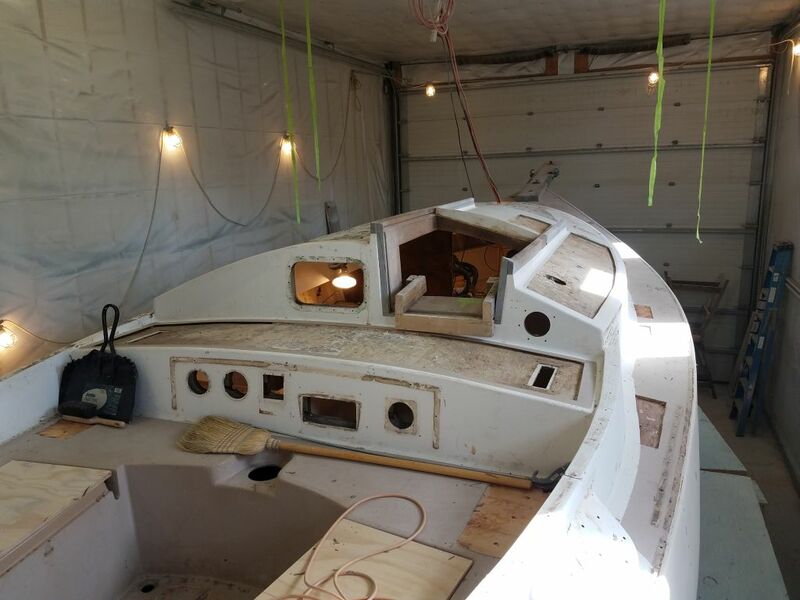 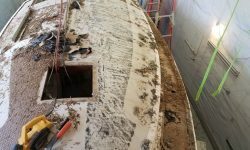 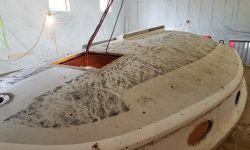 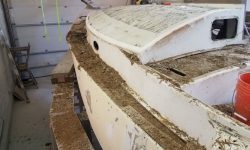 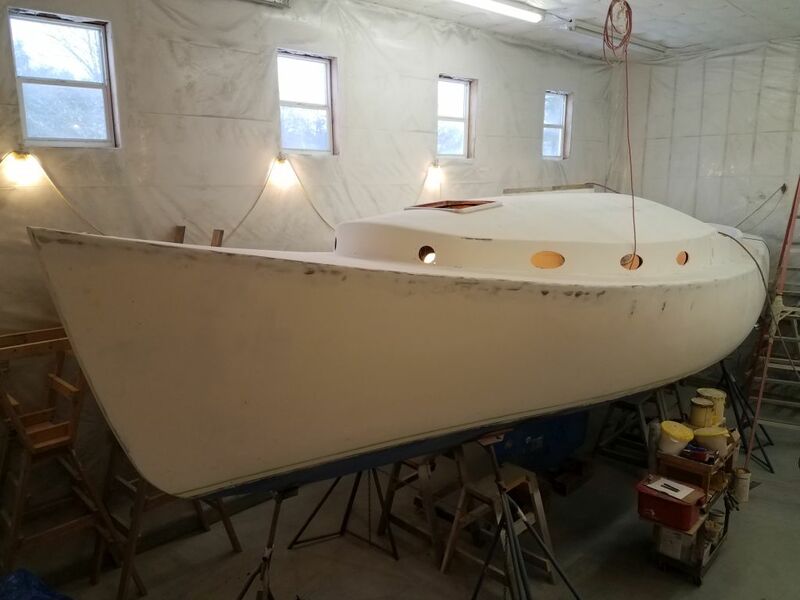 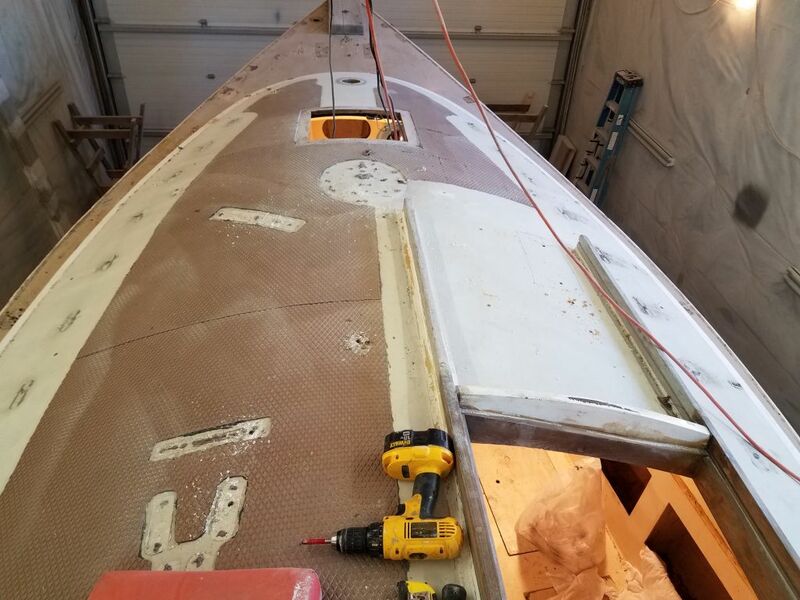 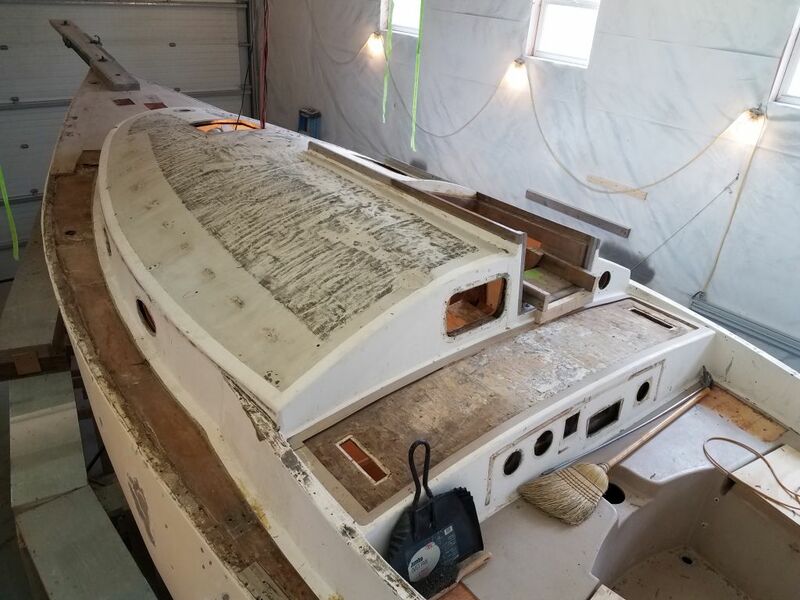 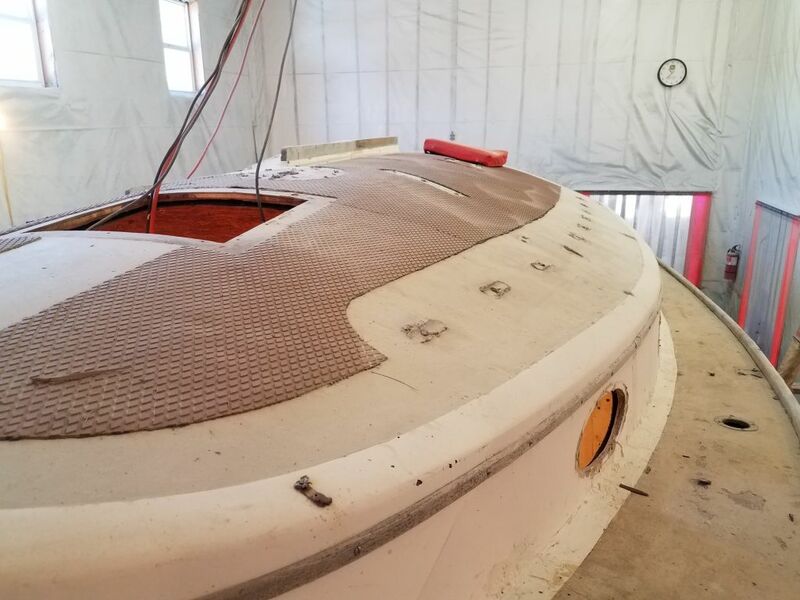 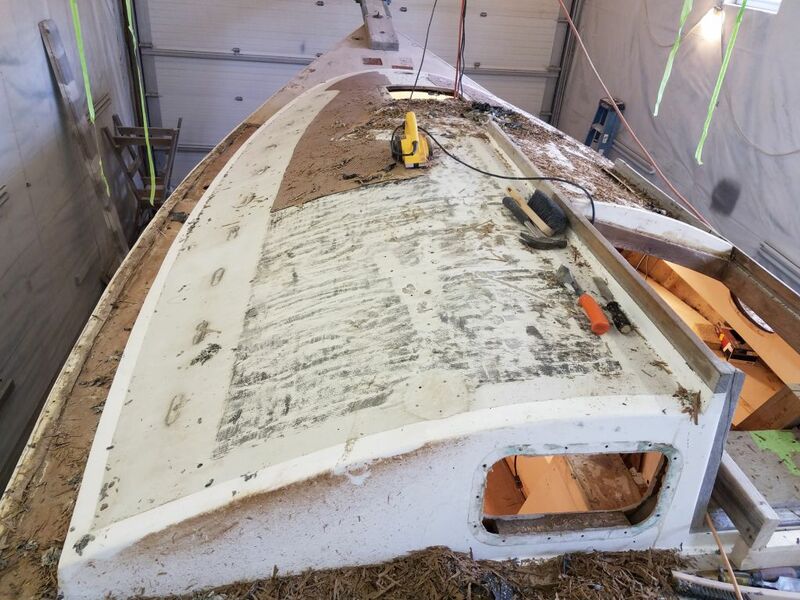 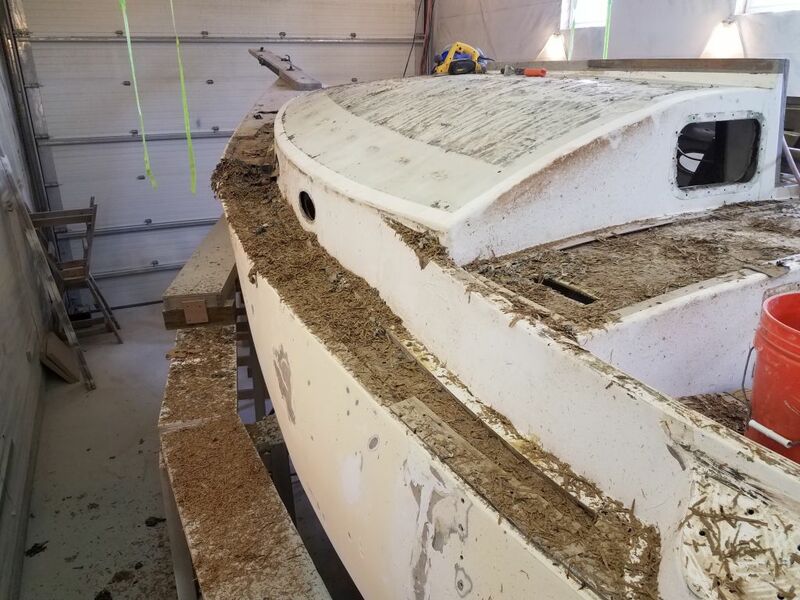 To get started, I tried the chisel method at the aft end of the coachroof, and made some progress, but I just couldn’t see doing the whole area (at this point it looked like a sports field in size) with a 1″ chisel. 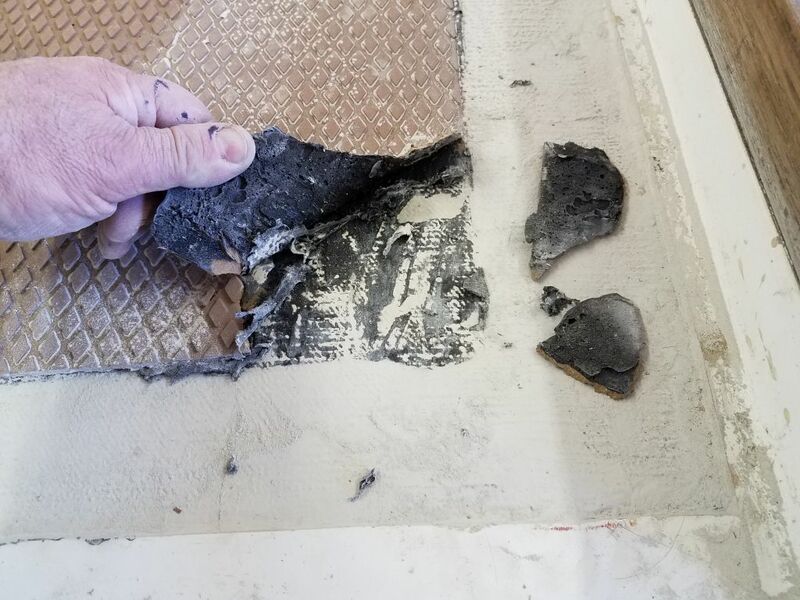 The adhesive, whatever it was (I thought probably a polysulfide) was not that aggressive, but was still resilient and flexible and, while at least possible to remove (unlike something like 5200 or epoxy), it wasn’t exactly a breeze either. 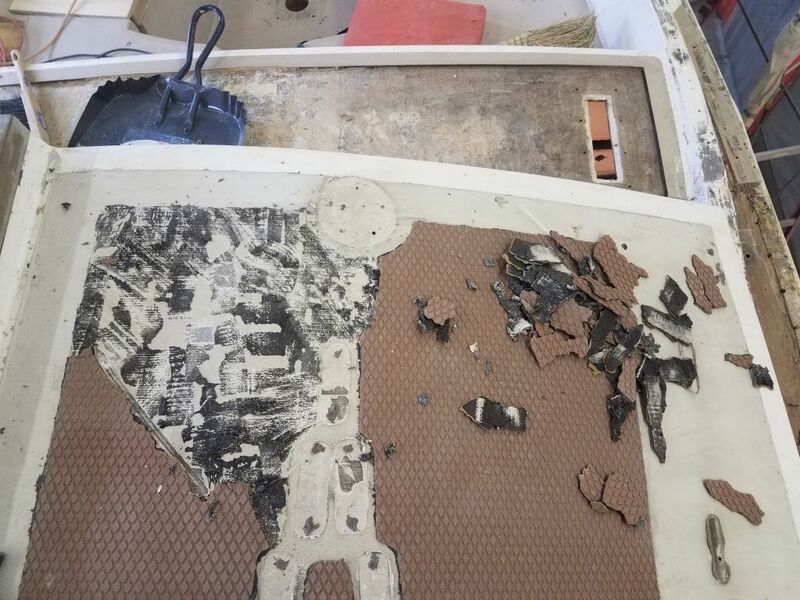 In an earlier project, I’d had pretty good success using a power planer to remove the Treadmaster. 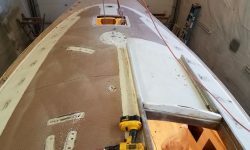 I’d held off trying it here because I had some dim memory of my planer being inoperable, though I couldn’t remember why, but I soon found that I’d been stymied changing the blades the last time (this was in 2010) because of a recalcitrant fastener holding one of the blades in place. 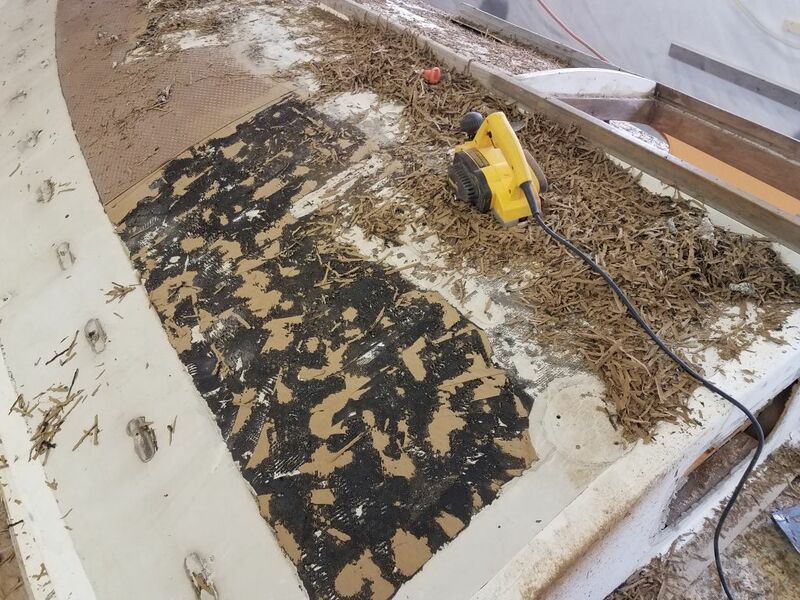 Apparently I’d put the planer away and never used it since. 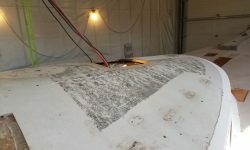 Now, though, I discovered that I’d apparently purchased replacement parts for the screws at issue, so I was eventually able to use semi-destructive means to remove the fastener (I used a Dremel tool to cut a slot for a screwdriver, since the Allen screw head was stripped), after which I could complete the blade replacement with the new parts that I’d ordered before. 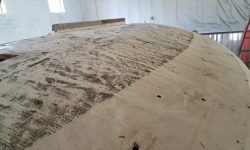 The planer worked quite well. 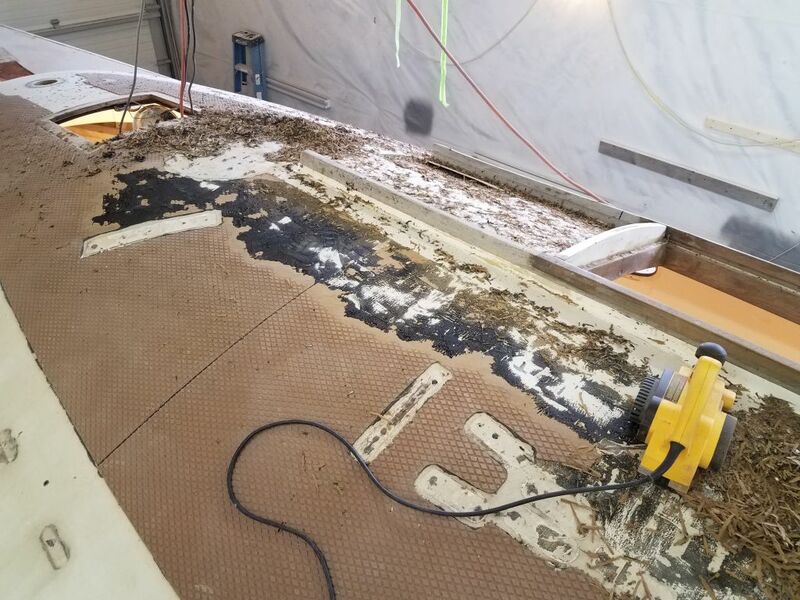 Fortunately in this case the deck was all convex and wide open making it easier for the flat base of the planer to work; it doesn’t do so well on tight spaces and with different curvatures. 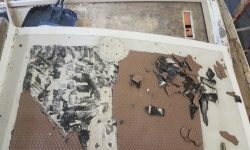 This removed the bulk of the Treadmaster easily and pretty quickly, generating huge piles of debris. 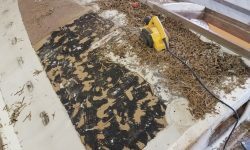 Once I got down to the flexible adhesive, I I found I couldn’t really use the planer any more, as the base bound on the rubbery surface and didn’t really allow planer movement, though the blades would cut through it if I could keep the planer moving. 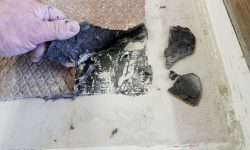 To remove the rest of the adhesive, I turned to my 1″ chisel (I tried a larger one but it wasn’t as effective), and hand-scraped the bulk of the adhesive (which, thanks to the undulations in the deck beneath, was quite thick in many areas) and thin remnants of the nonskid material, much of which came off in stretchy sheets. 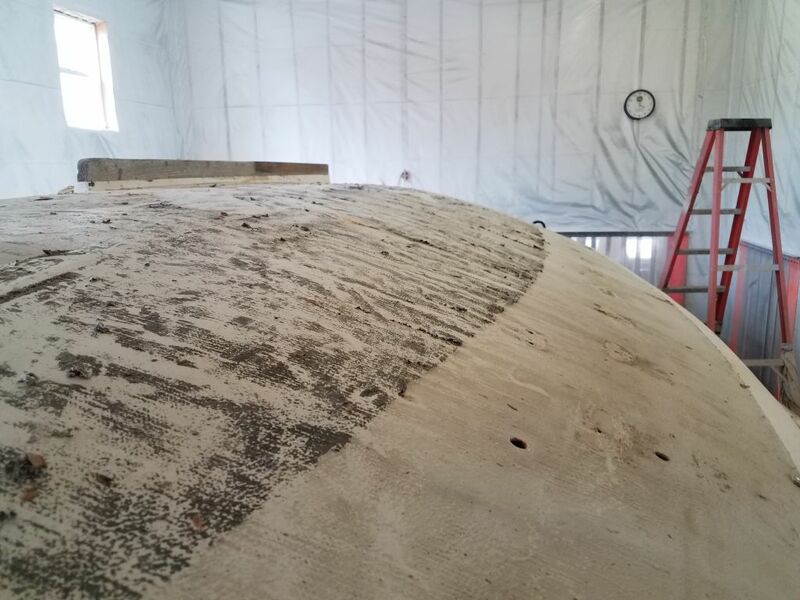 This left just a bit of residue behind which I cleaned off with a carbide paint scraper, leaving a surface that I could finish up another time with a sander. 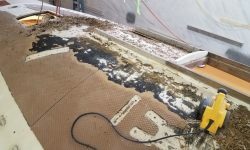 The scraping steps were plenty of work, but it wasn’t that difficult to remove the adhesive cleanly. 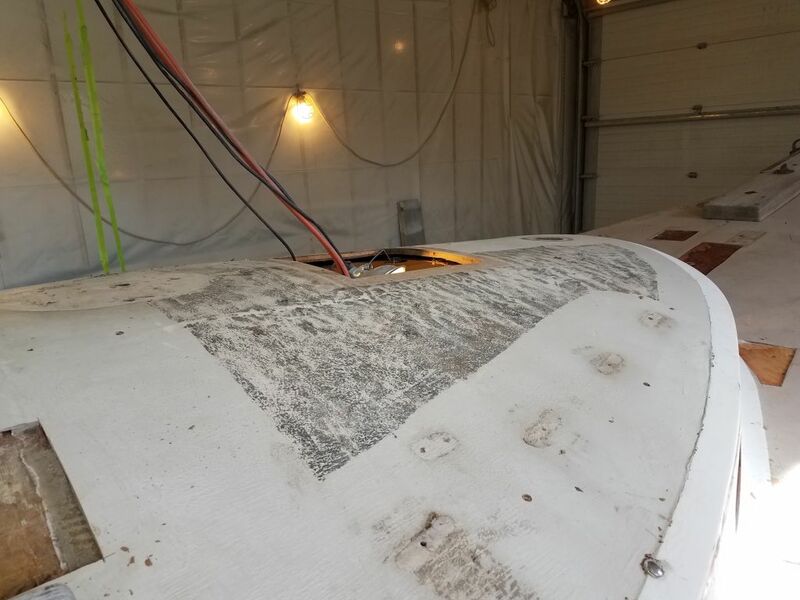 In this three-step manner, I continued for the remainder of the day, eventually removing all the Treadmaster and virtually filling a large garbage can with the spoils. 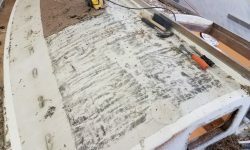 The planer blades were pretty dull by the end, but still managed to do the job I needed them to do, if a bit more slowly. 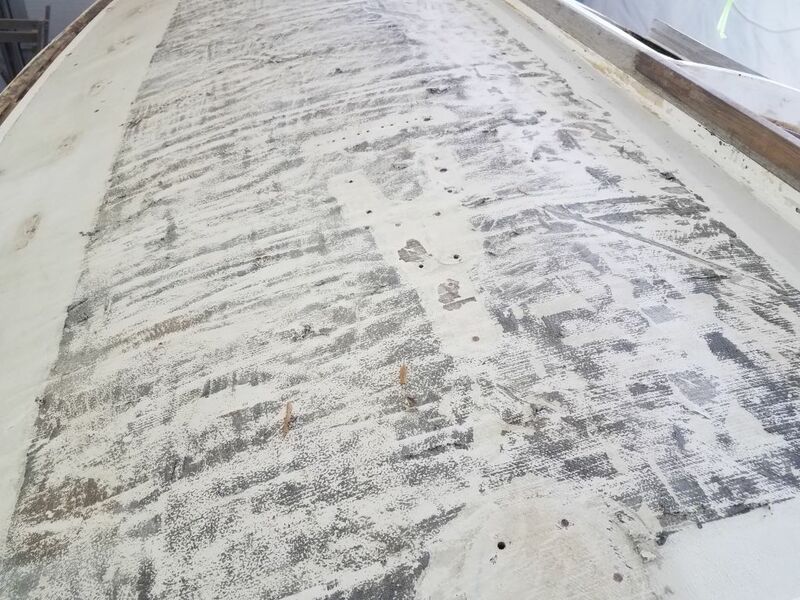 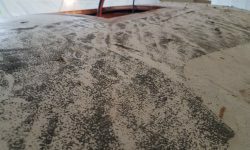 I found as I went on that it was easier to leave a thin skim of the Treadmaster rather than fight through the top layer of adhesive, with no noticeable increase in difficulty for the scraping steps afterwards. 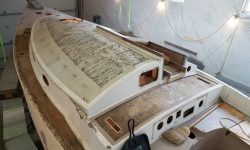 The deck beneath would require plenty of additional work to properly fair and finish, but despite that the glasswork had seemed sound throughout the process.